Next week begins the High Holidays for Jewish families. Growing up, I remember going to synagogue with my family and listening to the shofars being blown. What I do not recall is reading childrens books about the holidays. I am sure if they were in existance. If they were, my mother would have bought them for us since we did have our token Chanukah stories that were around. The PJ Library® program supports families in their Jewish journey by sending Jewish-content books and music on a monthly basis to children from age six months to five, six, seven or eight years depending on the community. Created by the Harold Grinspoon Foundation, The PJ Library is funded nationally in partnership with the Harold Grinspoon Foundation, local philanthropists, and Jewish organizations. Check whether The PJ Library is available in your community. 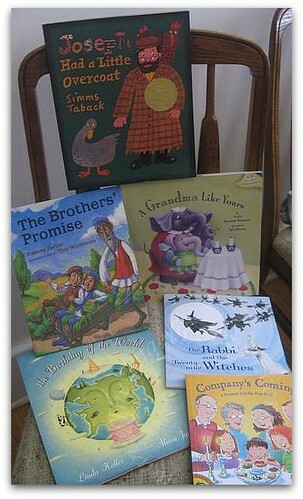 Find out how to become a PJ Library partner. At this time, The PJ Library is available in more than 100 communities across the United States. Each community is sponsored by a local Jewish organization and local donors who share a passion for vibrant Jewish life. 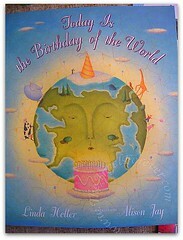 Just in time for Rosh Hashanah, JSL received Today Is the Birthday of the World by Linda Heller (Amazon affiliate link). Today is a special day: the birthday of the world, when God and all God’s creatures celebrate the beauty of life. As God asks each dear creature in turn whether it has been the best that it can be, this simple affirmation of life and goodness applauds the contribution that each and every one of us— from the mightiest elephant to the smallest child— can make. The whimsical animals in Alison Jay’s perfectly composed crackled paintings will make this a favorite book on the family shelf. As a parent, I love that The PJ Library also includes ideas and information for the adults. This is the note inside the book from the PJ Library. Note how they really help to explain the connection of the book to the holiday. Rosh Hashanah – Jewish New Year. During Elul, the final month of the Hebrew year, the shofar (ram’s horn) sounds in synagogues around the world to announce the approaching year, Rosh Hashanah, which begins on the first of Tishrei. At this time in the annual cycle we are reminded of the world’s formation – the birthday of the world! – and the six days of creation as expressed in the first book of the Torah, Bereshit (Genesis). Children everywhere look forward to birthdays and, naturally, some of the anticipation involves presents. Here is an opportunity to celebrate the world’s birthday while teaching a lesson in "price-less" gift giving. We can all observe the brithday of the world, in part, by giving back to the earth. Get creative as your family takes part in the now-more-than-ever critical work of tikkum olam (repairing the world). Involve everyone as you increase efforts at recycling, have your little ones decorate signs to remind everyone to turn off the water when brushing teeth, walk rather than use the car when possible, or plant a tree in your yard (or your neighnor’s). Allow imagination to soar! Throughout Today Is the Birthday of the World we see God’s creatures performing acts that only they can carry out, a reminder that there is no one correct way to offer the world our best. As the child paints, plants, or shares with others we can only imagine that this is what is intended for us all: life interwoven with mitzvot – sacred deeds performed out of responsibility and care – that help make the world the best it can be. The culmination of each of this book’s creatures "doing what comes naturally" is the child who, we are told, is able to "life the world’s spirit." How can your children list the world’s spirit? As you encourage inclinations to sing, draw, bake, read, week, share, smile, respect, conside and love, you foster the world’s best. The boys and I read this book to get ready for the High Holidays. I think a lot of it went WAY over JSL’s head. He is only three and liked the pictures, but I do not think he truly got the message of the book. NHL is seven and definitely got it. When we were done reading, we talked about ways that we could all be the best and help to lift the spirit’s of the world. We brain stormed for a while and are going to work on a few arts and craft projects to express this and share with other family friends in the upcoming weeks. Disclosure: My son received this book as part of our membership to The PJ Library. We were never asked to write about the book or PJ Library. I just wanted to share this information and a good book with my readers. The opinions expressed in the review are my own and no compensation was given. My kids are reading on their own these days: the older is finishing the Hunger Games series, while the younger is working his way through the Harry Potter series. I love to surround myself with books, and I’m usually in the middle of multiple educational books as well as one fun book. My fun reading right now is Gary Buslik’s A Rotten Person Travels The Caribbean. It’s like he’s writing about me! JK!